Rev up your mealtime routine with a Pasta Bar theme featuring Barilla Pastas and Sauces. A pasta bar can turn dinner into an event and please even the pickiest of eaters. Whether you have a theme in mind or want to put some leftovers to good use, be sure your toppings includes a little something for everyone at the table. Just start with your favorite Barilla Pasta and Sauces, then let your creative juices flow. From family favorites, to spicy originals, the recipes below are just some suggestions of where you can take your pasta bar! Give your favorite marinara pasta recipe a spicy kick with a spread of fiesta-inspired toppings like sliced jalapeños, ground beef, chopped yellow onions and bell peppers. Give Barilla® Rigatoni Marinara Fiesta Style a try and spice up your pasta dinner tonight! Ready for a little Mediterranean fusion? When Barilla Penne and Basil Pesto Sauce meet Greek olives, seasoned chicken and other fresh toppings like chopped onions and cherry tomatoes, that's exactly what you get. Give your pasta dinner a flavorful Mediterranean twist with Barilla® Pesto Penne al Mediterraneo pasta recipe. Chicken. Bacon. Spinach. Broccoli. It's hard to find ingredients that don't taste even better with a little Barilla® Creamy Alfredo Sauce. 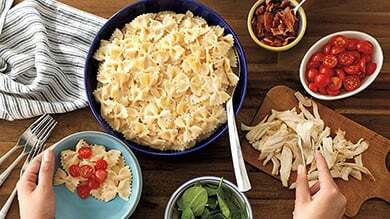 In this Farfalle Alfredo pasta bar recipe, we suggest toppings you might like, but choose a bunch that you know your family will love. Then, watch the smiles happen.